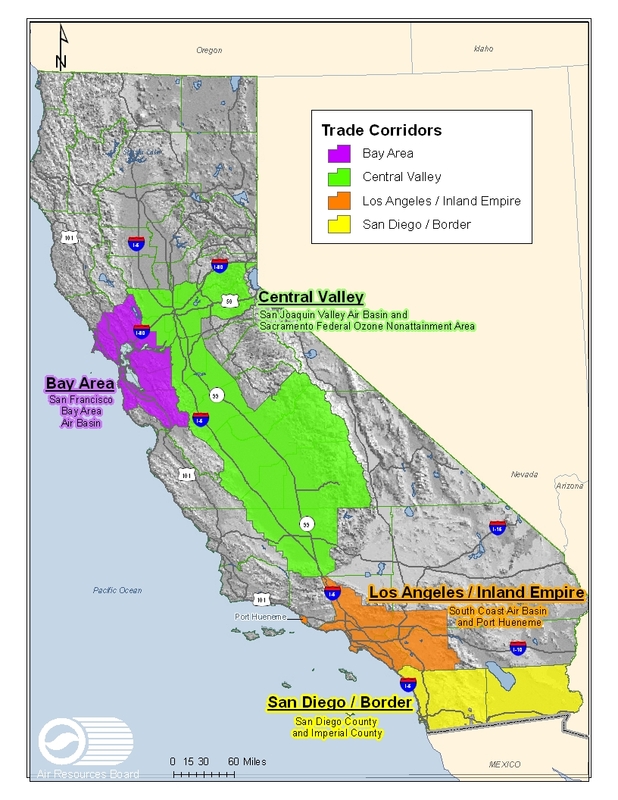 Intent or Criteria: The $1 billion Proposition 1B: Goods Movement Emission Reduction Program (Program) is a partnership between the State Air Resources Board (ARB) and local agencies (like air districts and seaports) to quickly reduce air pollution emissions and health risk from freight movement along California's trade corridors (map). Local agencies apply to ARB for funding, then those agencies offer financial incentives to owners of equipment used in freight movement to upgrade to cleaner technologies. Projects funded under this Program must achieve early or extra emission reductions not otherwise required by law or regulation. Program Status: ARB has allocated approximately $980 million for local agency projects and ARB's administration costs over multiple years. The status of each grant is summarized on the attached December 2018 semi-annual update for the Department of Finance. Administrative Agency: California Environmental Protection Agency / Air Resources Board. Recipient Agencies: ARB awarded funds to local agencies, including air districts and seaports. Accountability Plan: The Department of Finance approved ARB's three-part accountability structure for this Program, required by Executive Order S-02-07, in February 2008. When can I apply for Proposition 1B funding? Local Air Districts are not currently accepting applications. To receive information on Proposition 1B funding opportunities for other equipment, please sign up for our list serve gmbond. To learn about other financial incentives for heavy-duty trucks, please visit the Truck Stop. Program Hints and Tips includes information to assist equipment owners in applying for Program funds to upgrade their truck and to maintain eligibility during the Year 5 Truck Solicitation. Class 8 Funding Chart includes information to assist equipment owners of Class 8 trucks with their options for selecting an eligible replacement engine/truck, including funding amounts. Class 7 Funding Chart includes information to assist equipment owners of Class 7 trucks with their options for selecting an eligible replacement engine/truck, including funding amounts. Class 6 Funding Chart includes information to assist equipment owners of Class 6 trucks with their options for selecting an eligible replacement engine/truck, including funding amounts. Class 5 Funding Chart includes information to assist equipment owners of Class 5 trucks with their options for selecting an eligible replacement engine/truck, including funding amounts. 2-for-1 Funding Chart includes information to assist equipment owners of two Class 6-8 trucks with their options for selecting a single eligible replacement engine/truck, including funding amounts. September 2015 Board Resolution 15-43 and explanatory Staff Report on award of $220M in Year 5 funds. 2015 Program Guidelines that define the responsibilities of ARB, local agencies, and equipment owners, as well as the technical specifications and funding caps for eligible projects. September 2015 Supplemental Procedures for Ships at Berth and Cargo Handling Equipment Projects. June 2015 Board Resolution 15-20 and explanatory Staff Report on adoption of Update to Program Guidelines. July 2013 Board Resolution 13-34 and explanatory Staff Report on award of $154M in Year 4 funds. February 2013 Revised Supplemental Procedures for Ships at Berth and Cargo Handling Equipment Projects. January 2013 Board Resolution 13-5 and explanatory Staff Report on adoption of Update to Program Guidelines. December 2011 Board Resolution 11-40 and explanatory Staff Report on award of $100.8M in Year 3 funds. June 2010 Board Resolution 10-27 and explanatory Staff Report on award of $200M in Year 2 funds. March 2010 Board Resolution 10-18 and explanatory Staff Report on adoption of Update to Program Guidelines. May 2009 Board Resolution 09-40 amending the Guidelines to reflect the delay in bond funding, the transfer of funds to backup projects, and other changes to existing grant agreements to support implementation. May 2008 Board Resolution 08-06 and explanatory Staff Report on award of $221M in Year 1 main grants. February 2008 Board Resolution 08-12 and explanatory Staff Report (includes implementing legislation) on adoption of Program Guidelines and award of $25M in early grants. January 2017 Executive Order G-17-004 adopting modifications to the Program Guidelines for Year 5 trucks, cargo handling equipment, and TRU projects. May 2016 Executive Order G-16-024 adopting modifications to the Program Guidelines for Year 5 ships at berth projects. February 2016 Executive Order G-16-009 adopting modifications to the Program Guidelines for Year 5 truck and locomotive projects, and the reallocation of unspent funds. May 2015 Executive Order G-15-033 adopting modifications to the Program Guidelines for the filter substrate replacement program, operational deadlines for Year 4 truck projects, and the reallocation of unspent funds. October 2013 Executive Order G-13-089 adopting modifications to the Program Guidelines for Year 4 funds and allocations of recaptured funds to provide the greatest incentive funding opportunities for eligible small truck fleets. May 2013 Executive Order G-13-050 adopting modifications to the Program Guidelines for truck reuse pilot projects and truck reuse programs. December 2012 Executive Order G-12-144 adopting modifications to the Program Guidelines for Year 1 through Year 3 and future funds. October 2012 Executive Order G-12-092 adopting the allocation of unspent drayage funds and Spring 2012 bond proceeds. April 2012 Executive Order G-12-032 adopting modifications to the Program Guidelines for maintaining eligibility for truck projects that become inoperable prior to replacement. July 2010 Executive Order G0-10-58 adopting modifications to the Program Guidelines for Year 1 and Year 2 funds. March 2010 Executive Order G-10-007 adopting modifications to the Program Guidelines for Year 1 funds. January 2010 Executive Order G-10-006 allocating additional funds to the Bay Area air district's Year 1 grant for trucks serving ports and intermodal rail yards. August 2008 Executive Order 08-012 approving requests by the Bay Area and San Diego air districts to defer early grant funds to main Year 1 grants. June 2008 Executive Order 08-011 changing the emission specifications for new switcher locomotives. ARB staff clarifications on Program requirements that address implementation questions posed by local agencies and equipment owners. ARB Executive Orders certifying new truck engines to show compliance with Program requirements for Year 5 funds. * Note that these calculators are in Excel 2010 version. Using previous versions of Excel may result in compatibility issues. If you should encounter these issues, please contact ARB staff at 916-444-6637 or email gmbond@arb.ca.gov. Delegation of Authority to Submit Grant Disbursement Requests that local agencies can use to identify individuals authorized to sign these requests. Compliance check template for local agencies to provide information to ARB to evaluate whether the equipment owner and/or piece of equipment have any outstanding violations of ARB regulations on record. Sign up for our list serve gmbond for meetings notices and updates. Call the Goods Movement Information Line at (916) 44-GOODS (444-6637).